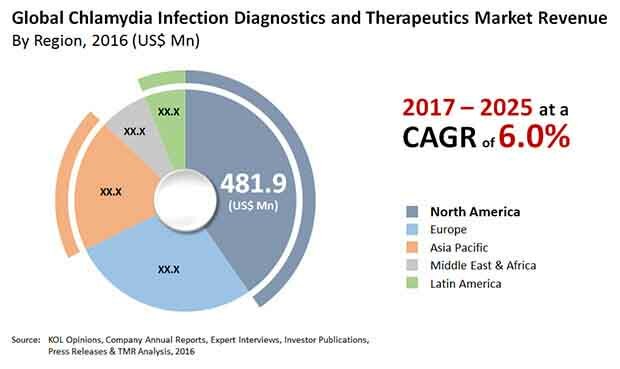 The chlamydia infection diagnostics and therapeutics market unveils high potential owing to the rapidly rising patient pool and vast untapped opportunities, especially in developing economies across regions such as Asia Pacific and Latin America. The market expected to exhibit healthy growth in the near future due to the increasing focus on treatment of sexually transmitted diseases globally. There is a need for enhanced techniques of diagnosis of pelvic inflammatory disease and for signs of chlamydial infection that expects women at high threat of tubal damage. Chlamydia trachomatis is the most commonly reported sexually transmitted infection in the world. The rate of reported chlamydia infection diagnoses continues to increase. Transparency Market Research estimates that the global Chlamydia Infection diagnostics and therapeutics market will expand at a robust CAGR of 6.0% over the forecast period between 2017 and 2025. Chlamydia infection therapeutics market is segmented by product type into macrolides, quinolones, sulfonamides, tetracycline, Aminopenicillins. Physician prescription preference for antibiotics such as macrolides and tetracycline is driving the growth of chlamydia infection therapeutics market. The segment of macrolides is expected to expand at a promising pace during the report’s forecast period. This is followed by the direct fluorescent sub-segment, which contributed for second highest share in the global Chlamydia Infection diagnostics market in 2016. In terms of revenue, North America was the largest regional market for chlamydia infection diagnostics and therapeutics market, and accounted for a share of over 55.5% of the chlamydia infection diagnostics market and over 44.5% of the chlamydia infection therapeutics market in 2016. Supremacy of North America has been attributed to well establish health care industry, increasing incidence of chlamydia infection among population, and availability of well-defined reimbursement policies from public and private health insurance firms. Better diagnostic and treatment rates, in part due to proactive awareness initiatives undertaken by public and private bodies, have also led to North America gaining the predominant share in the global market. The Asia Pacific market, owing to its vast potential to quickly adopt to new therapies owing to the presence of several strengthening economies, held the third position in the global market in terms of revenue contribution in 2016. The regional market continues to be price-sensitive and features the availability of cheaper generics as compared to North America and Europe. Key elements such as large pool of potential patients, implementation of government initiatives aimed at improving health care access, increasing incidence of chlamydia infection, improving infrastructure, and growing health care expenditure would drive the growth of the market in Asia Pacific. Some of the leading companies operating in the global chlamydia infection diagnostics and therapeutics market are Bio Rad laboratories, Novartis AG, F Hoffmann-La Roche, Abbott Laboratories, Danaher, bioMerieux, DiaSorin SpA, Siemens AG, Thermo Fisher Scientific, and Becton Dickinson and Company.